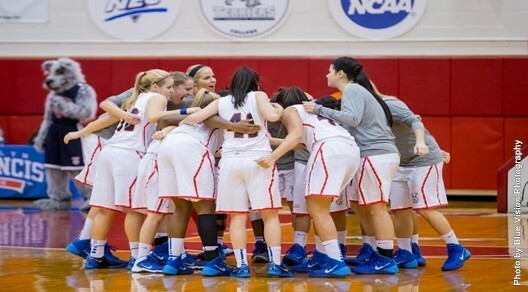 The St. Francis women’s basketball team defeated the UMASS-Lowell Riverhawks 77-59 on November 23, 2013. SFBK’s Eilidh Simpson had the game high of 24 points. Seven of which are three pointers. This ties her with Sarah Benedetti for the mount of three-pointers scored in a game. Sarah Benedetti shot 17 points, followed by Jaymee Veney who shot 14 points in the game. Ozana Marginean and Taylor Watson and both made their season debuts. The UMASS-Lowell Riverhawks opened up the first half with a three pointer and two free throws. Leading the Riverhawks was Asia Mitchell with 15 points, followed by Melissa Frase with 10 points and Lindsay Doucette with 8 points. The Terriers are now 3-1. The St. Francis Women’s basketball team will face the New Jersey Institute of Technology on November, 26 at 7 p.m. in the Pope Physical Education Center.